We've had a few problems over the last few days. On Christmas Day, we had a theft of money and of a parishioner's coat. Yesterday, a hat was taken. Today we had vandalism in the church. I suspect that the same person was responsible for all these offences. So I phoned the police. These days there is only one line for the whole of Sussex (I didn't want to phone the emergency 999 [=911]). Although I phoned during working hours (4.30pm), the phone rang for twenty minutes without an answer, and even without a voice to tell me that my call was important, and the lines were busy. Just, no answer. So I've locked the church. In the years when I was a parish priest, I was always delighted when the Bishop offered a Pastoral Letter for this particular celebration coming, as it does, so quickly on the heels of Christmas. It wasn’t just that we felt “talked out” after all the Christmas festivities, it was also that I, at least, felt that preaching about the Holy Family – that almost impossibly “holy” Family - was a very difficult task. I can’t pretend that today I can say anything new but I do want to offer you a few thoughts, as well as giving you my greetings for today and for the whole Christmas season. First of all, our celebration today gives us “family” at its best and we particularly need that at this time when, politically and often socially, family life is being undermined and diminished. In this celebration, we are offered a supreme example of trust, obedience and generous love. Speaking for myself, I can say that I have been very blessed in a very happy and fulfilled family life, but I am acutely aware that this is not everyone’s experience and I both acknowledge and sympathise with the pain that many, who are in broken families, suffer and endure. But it’s not just family life that’s under threat in today’s world – we live today in many ways in what Pope John Paul described as a culture of death. Life itself has become cheap and, as a society, we have become careless and destructive of life, whether that life is found at its very beginnings, in the womb and in the unborn child, or in the old and frail as they approach natural death. To see such persons – for that is what they truly are – as somehow disposable or a nuisance or of no consequence, is to show a supreme disregard for the value and dignity of all who, like ourselves, are children of a loving God. As Catholics, we pride ourselves on being “pro-life” and that is true for the diocese, for all of you who form our diocesan family and for myself. We are committed to defending life at all its stages. This commitment is the seamless garment for Christian living, and it means that all, but especially those who suffer from defencelessness and vulnerability of any kind, poverty, disease and conflict, have a right to a special place in our hearts and in the heart of the Church. This rich vision of life will not necessarily endear us to the culture in which we live but this is where we have to stand if we are to be faithful to the truth that all human beings, our brothers and sisters, are created in God’s own image and likeness. This celebration of this feast of The Holy Family gives us the chance, not only to catch our breath after the Christmas festivities, but also to contemplate something of the reality of the circumstances and family that surrounded the Word made flesh, the Light of the world, Jesus Christ, Son of God, who has lived among us. In this contemplation and prayer today, we rejoice in the gift of life in all its richness and dignity. Our prayer is also that we treasure and sustain, as best we can. the precious gift of family in which that life is nurtured and in which it flourishes. I send you all my greetings at this time and I pray that the Lord will continue to bless us all with his love and his grace as we enter into the New Year of 2009 which will be upon us in a few days. From the article Carols old and new, in The Tablet, 20/27 December 2008, by Nicholas Williams. Paradoxically, our exposure to genuine tunes, whether folk songs, carols, hymn tunes or even lowly nursery rhymes, has surely diminished relative to the torrent of music that now overwhelms our senses. And though there's never been a better time for melody, it may also be time to reassert the tune — symmetrically patterned, shaped by rhythm, rhyme and tonal cadence — as the ground of our listening and the essential pattern of Western music since the Renaissance. A similar awareness lies, perhaps, behind the movement for reforming liturgical music, with the structures of chant as the ideal vehicle for sacred observance. Unstated, too, is surely the perception that some styles and forms are better than others —"better for being listened to" in every sense of that phrase—that only the best is sufficient for the service of God, and that the man-centred ethos of the guitar Mass and worship song is simply not good enough. In the meeting of art and faith, matters are rarely straightforward. While espousing the cause of Palestrina and a cappella singing, for example, elements of the nineteenth-century Cecilian Movement for the reform of Catholic music would have also prohibited the Masses of Haydn and Schubert. But for all those entrusted with the duty to revive the quality of music for worship, Vaughan Williams, Hely-Hutchinson and others point in the right direction. Confronted with both the riches and the false authenticities of our musical scene, bishops, composers and choral directors will need artistic clear thinking, particularly in furnishing music of lasting worth for the forthcoming English Mass translation. What these modest, carol-based works remind us is that, for a wise outcome, the example of history should count quite as much as easy accessibility, or fashionable sociological precepts about music, in determining their choices. There: happy now? Christmas tree with decorations in my sitting room. And, Mac, thank you for a wonderful post on the Sacrament of Confession. I'm having a Mapp and Lucia phase at the moment. I came to these wonderful books rather late; in fact in my mid-thirties. It was Fr Daniel Seward of the Oxford Oratory who introduced me to them at about the time I left that community, and it says something for my immediate desperation to read more that I took his copy of Queen Lucia away with me and had to post it back when I finished it. I find E.F.Benson's writing utterly entrancing and cripplingly funny; if the books have a fault it is that there are not enough of them. I am not the only one to think that, for others have tried to write more. Tom Holt made a pretty good stab at it, producing Lucia Triumphant and Lucia in Wartime, where he doesn't quite catch the limpid, acid, prose, but the storylines are pretty good. There has been a new Lucia book just published, called Major Benjy, by Guy Fraser-Sampson. As soon as I spotted it, I rushed to buy it, but have regretted the expense. Neither prose nor storyline hold a candle to even Tom Holt's books. The worst aspect, I think, is the way that he has utterly failed to catch the tone of Tilling (the town where most of the action takes place). Tom Holt himself is credited with saying 'Benson himself would have loved this book, and so will you'. I wonder if we are speaking of the same book. How could anyone think that, for instance, Benson would have loved coarse sexual innuendo? Gentility was the very essence of Benson's books. Major Benjy opens the door to Miss Mapp without his trousers; he gets seduced by his housekeeper; Irene Coles and Lucy plaster each other's naked bodies with paint…… need I go on? It is more redolent of Tom Sharpe (though without the genuine—though crude—acute humour of that talented writer) than Benson or even Tom Holt. The characters behave uncharacteristically, also. Mr Wyse regularly props up the bar of a local pub, for instance. In this, I think Fraser-Sampson followed something from the TV adaptation of Mapp and Lucia rather than the books themselves. Twistevant, the shopkeeper, is spelt in three different ways within the first fifty pages. And, frankly, the book is boring: I've given up half way through. How very disappointing. How tarsome, in fact. I've been revisiting the Benson books by medium of my iPod. Some are available on iTunes, read wonderfully by Nadia May. 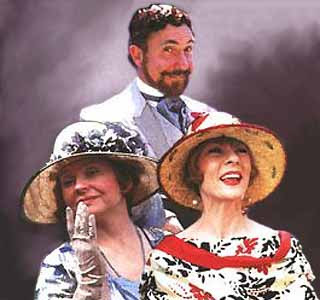 Mapp and Lucia is read very well by Prunella Scales (who played Miss Mapp on TV). And now I have found the rest of the books on CD and am busy transferring them one by one to my iPod. Even the Tom Holt books are available in this form. I'm listening right now to Lucia in London, read by Geraldine McEwan (who played Lucia in the TV adaptation). Which brings me on to the last topic, which is that of the TV adaptation. I didn't really think it was terribly good, I'm afraid, (though others disagree) and I think it's time for another try. The question is who one might get to play the chief roles. I've thought a lot about this, and I think that there are some very good candidates. I would love to see Penelope Keith play Lucia and Patricia Routledge play Miss Mapp: both of them are simply made for the role, I think. Georgie Pillson is a more difficult decision, but I wonder whether John Cleese wouldn't do it really well. All these three actors physically resemble their characters, and I'm sure could bend their considerable talents to the parts. 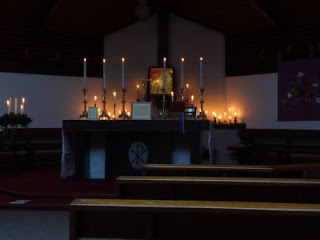 Those of a more traditional turn of mind sometimes instinctively dislike what are called 'penitential services', by which I mean those services which often take place in parishes during Advent and Lent during which many of those who do actually go to confession at all celebrate the sacrament together. Another innovation, some feel. And yet actually it is more a revival than an innovation. Something very similar took place in pre-Reformation England. At that time, and in this country, annual communion, at Easter, was, pretty well, the universal custom. It was prepared for very carefully, and the parish priest would confidently deny communion to any he felt were unworthy of it. Part of the preparation was something not unlike a penitential service; in country areas, at least, where there might be only one priest, that parish priest would call in his priest friends and neighbours from the surrounding area to hear the confessions of everyone in his parish. And not just confessions; on that occasion, the penitent would also be asked to recite the Our Father, the Hail Mary and the Apostles' Creed, to make sure he knew them. One might also conclude, then, that annual confession was also the custom, though no doubt others might avail themselves of their parish priest's absolution on other occasions. 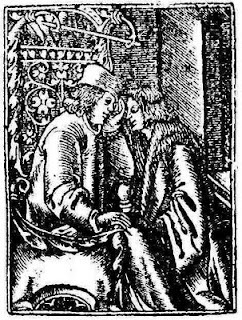 The picture is taken from a Sarum Primer of 1534. In the combox on Fr Tim's blog, one Fr Seán Coyle wrote the following note about those who say that they will not go to confession because they always confess the same things. Pope Benedict in October 2005 to 100,000 at the annual audience for children who have recently made their First Holy Communion: One girl asked the Pope why she must go to confession before receiving Communion, if our sins are always the same. “The same”, he said, “is true of our souls. If we never confess, our souls are overlooked. I may be pleased with myself, yet I do not understand that I have to improve constantly in order to progress. Confession helps us to have a more open conscience and thus to mature in a spiritual and human way." A priest-friend of mine once asked a mechanic in Ireland why he should bother washing his car, since it would get dirty again. The mechanic responded, "Dont you wash your face every morning?" Mac the MF has tagged me for a meme, but in this case, I'm afraid she will be disappointed. She wants to know the story of the really special ornament on my Christmas tree. Look, Mac, I'm a bloke, basically. Yes, I do put up a Christmas tree in my window, but it's only because others expect it—left to myself, I wouldn't bother. And there really aren't any special ornaments—just what I could hoover up cheap in Homebase a few years ago. This has reminded me depressingly that today or tomorrow I must crawl up to the attic and bring the wretched thing down again, then assemble and dress it, only to do the whole thing in reverse in a couple of weeks' time. Some people actually enjoy this sort of thing. Now I feel like a failure. Perhaps I should listen to my feminine side more. And no doubt if I had a family, it would be different. The Christmas tree was special when I was a child. And yet—the sheer wonder of the fact of the Incarnation still staggers and fascinates me. I love the Christian feast of Christmas; I'd just rather not bother with some of the bits that seem to have to go with it. Photo: Michael Stringer, with thanks. "How many times is hell mentioned in the New Testament? Do a word count." —not, I hasten to add, that I think that this should form the backbone of one's preaching, but it should be there somewhere, because it is not an irrelevant part of the New Testament. Our Society is constituted to provide the Mass to as many catholics as possible from all walks of life in churches and chapels the length and breadth of England and Wales, the majority of those who attend these Masses would not have understood anything of the splendour of Merton. It is wrong therefore for the favoured few to be able to indulge in the obvious luxury of the liturgy provided. Many people (laity) have worked for the LMS for many years for no more than their expenses and a good number of them have not claimed for anything at all. Look then at the tuition fees and the expenses paid from the figures provided for 29 first time and 15 second time delegates from England and Wales. The clergy were in awe at the generosity of the Society they must have been laughing all the way back to their presbyteries at the size of the party bags distributed as gifts. The whole concept of Merton (an Anglican institution) is privileged, the cost of Merton is obscene, continually asking our membership to subsidise elitist events is wrong. The direction the Society is taking is a cause for concern, high profile and elitism are the flavours of the day, committee must resist this, it must resist any thought of returning to Merton any proposal to do so must be overturned. I found this very sad reading. David Lloyd is a man I like and respect; I have had dealings with him in the past and found him affable and kind. But I have to disagree profoundly with him on this matter which for me raises a ghost which I thought laid—I might add, laid with David's help (he being then in the chair). This ghost was the tendency which the LMS had a few years ago (and no doubt is not dead) to support only those clergy who were prepared to celebrate exclusively the traditional rites: their website then even proudly boasted it. It made me think of those priests, diocesan and religious, who for years had endured contempt and marginalization from their brothers and superiors for their willingness to keep celebrating the traditional rites for members of the LMS. That what we now call the Extraordinary Form was maintained in this country was due in no small measure to men like Mgr Macdonald, Fr Michael Ware and Fr Mark Taylor. They, like I, for so many years, also received only expenses, and very often not even that. The Merton Conference was a most valuable resource in making it possible for ordinary diocesan and religious clergy to learn to be able to celebrate what is now entirely legitimate. It is firmly established that the traditional rites are not for an exclusive elite, but ordinary Catholics in the pew have a right to them. Of the seventy priests who attended last summer, most went home able to begin celebrating in the Extraordinary Form with some measure of confidence, which will grow as they get used to it. Yes, these men are unlikely exclusively to do so, but then they are men who do not believe that the vineyard of the Lord is confined to traditional Mass centres. They believe, as do I, that the people in ordinary parishes are Catholics too, with souls that need saving and sanctifying, and though the Ordinary Form is not such an efficient tool, nonetheless it is the only tool that many of our folk will accept at present and thus we must make the best of it. But now they have also recourse to the Extraordinary form, a better tool, which they can use as appropriate, both for their own sanctification and also for that of those who will come to appreciate it through their work. Although Mr Lloyd thinks that the Merton conference was elitist, in reality it was quite the opposite, since the intent is to bring the Mass precisely back where it belongs—in the parishes. Second, I feel personally very hurt at the suggestion that priests went laughing back to their presbyteries after the sybaritic extravaganza of the Merton conference, at the expense of the pennies of the LMS poor. The conference was not luxurious: all participants lived in student accommodation and ate (albeit very nice) student food. The liturgy was splendid, but the traditional rites are splendid, when done properly. Are the LMS suggesting that a large gathering of priests should have celebrated Low Mass every day and said the office in private? That would be ridiculous! Perhaps it was the presence of prelates they objected to, especially when they were treated properly. Then there was the goody-bag. Each participant was given a study edition (which is actually useable) of the 1962 Missale Romanum, costing about 50 Euros, a cheap set of unframed paper altar cards (with at least one mistake on them) and sets of bound photocopied notes for the courses. The one possible extravagance was a beautifully produced and bound liturgical book with the offices and masses for the week, which may have cost (judging by Lulu prices) about £10. Though the participants were heavily subsidized, they did have to find expenses that other types of employees might not have to, such as paying for supply priests in their own parishes while they were away, and transport—three priests came from South Africa. But the money was not the issue; I strongly suspect that many, if not most, of the participants would have paid for themselves entirely if that were required. I, as a member of the teaching team, was given an honorarium: I was grateful, but would have helped for nothing, quite happily. Should the Merton Conference not operate this year, it will prove to have been a pyrrhic victory for those who oppose it. Yes, the LMS may well have more money in its bank account, but there will be fewer priests able to celebrate the rites which they love. And, please, what is the money for? It is possible, I suppose, that another sponsor might be found, or perhaps priests might well be willing to pay for themselves. That would be great. But if the conference does not go ahead, then I would certainly be willing to take one or two priests (in good standing) at a time here for a few days to do the same thing, mutatis mutandis. No doubt others would be likewise willing. President Obama has promised to remove all restrictions over abortion in the USA in something called FOCA; the Freedom of Choice Act. There is a petition here which you can sign, opposing this, though I guess you have to be American to do so. Well, my new breviaries have arrived, and I'm delighted. Since my ordination twenty years ago I have been using a set of breviaries produced then by the Society of St Pius X, and which went out of production shortly afterwards. It is a photographic reproduction of the 1961 Mame edition, superior in almost every way to the Fraternity of St Peter's Dessain reproduction which has been available since. The problem was that these breviaries were like house bricks, comparable in size to the modern English breviaries—most impracticable when travelling. For this, I have a most beautiful small set produced by Pustet, (original, not photographic) though, alas, with the Pius XII psalmody. I received it in mint condition, too, never used. But now I have a set that does everything. The new edition, from Nova et Vetera, a new German publishing house, is quite lovely. The cream-coloured paper is thin, but opaque, and thus the book is (Deo gratias!) lightweight, lying easily in the hand. The typesetting is clear and easily readable, despite the fact that it is printed in relentless double columns throughout. The rubrics are not really ruber, but rather a shade of brown; this may have been a mistake; a typesetter forgetting that what looks one colour on white paper looks different on cream, or in fact it may be deliberate, for it looks very attractive—just different. It is bound in black leather (real!) and the edges are gilded all round—what a pleasure to have to blow the pages apart for the first time of use. I can detect no mistakes in the Latin so far—well, all right, only one, a small one. At Matins this morning (Advent Sunday II) we had a 'hedo' rather than a 'haedo', and the mediaevals wouldn't have thought it a mistake anyway. And there was no antiphon for Prime or Terce, though the antiphons suddenly reappear for Sext and None. This is not a disaster as long as one knows that the antiphons are simply those of Lauds in turn. A reminder to say the Pater Noster before the readings of the Nocturn would be a good idea, though anyone familiar with the traditional breviary would know this anyway. Prime is a little confusing; the changeable bits and the unchangeable bits are all in the same size, spacing and typeface, which means that, again, you need to know where you are going. So what I'm trying to say is that I, as a habitual reciter of the traditional breviary, find this new set a real delight. I'm not sure that a newcomer would find it so easy to use at first. But, beyond any doubt, Nova et Vetera are to be congratulated on producing not just another traditional breviary, but editing it from scratch, and coming up with a version that knocks all other available versions into a cocked hat, new rite or old. The breviaries cost me E198, and I was able to order alongside them a set of US propers (there are, alas, none for the UK yet) and, mirabile dictu, a booklet with the original versions of the hymns, something I blogged about a few months ago. Update: having been away for a couple of days, and having taken my little Pustet with me, I have realized that Nova et Vetera have simply copied the Pustet arrangement—a sensible thing to do, on the whole, since, as I said, the Pustet is very elegant. It's a pity they didn't improve on the Pustet's shortcomings regarding clarity and ease of use. I am saddened and surprised, though I suppose I shouldn't be. The Sons of the Most Holy Redeemer domiciled on Papa Stronsay have themselves divided over the issue of their reconciliation with Rome. One priest and two brothers have left the community, reverting to the former title of Transalpine Redemptorists, and have started an independent mission on Stronsay Island, celebrating Mass in a garage. I discovered this information yesterday, but have thought about whether comment should be made. But today there is an article about it in The Scotsman, which is quite temperate (even if it does describe the remaining members of the community in the monastery on Papa Stronsay—the vast majority—as 'the rump': shades again of Lambeth Palace blowing away from one of its tiles) and so I feel that as the cat is out of the bag, then I might have my say, too. Human beings are independent thinkers, and one must not expect people whose conscience has kept them out of apparent union with the Holy See for thirty years or more to find it easy to allay that conscience simply because others feel that the time is right. At the time of the reconciliation of Le Barroux, their daughter house in Latin America refused to follow the lead and remains part of the Lefebvrist family to this day. Fortunately, the fathers and brothers in the Orkneys are keeping charitable tongues in their heads, refusing to malign each others' consciences—which must be so tempting in these circumstances. I suppose all we can do is pray for them, and also that all who are at some distance, shall we say, from the Holy See may find their way home soon.